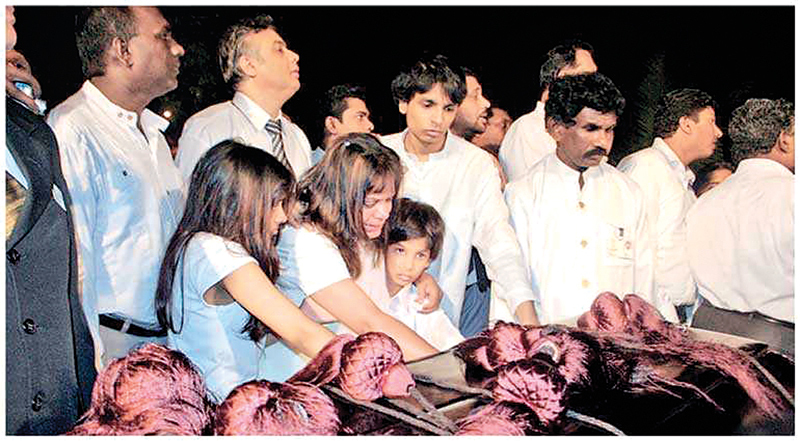 Raine with her three children; Avinash, Ahimsa and Aadesh; at Lasantha Wickrematunge’s burial. I first came to know of the MiG Deal in August 2007. I was living in Canada with family when my father called me from Colombo. He told me that the Sunday Leader had reported on a shady military contract involving Gotabhaya Rajapaksa and the Air Force. My father had just watched a television interview in which Rajapaksa had denied having any involvement in this “MiG deal”. A few days later, on Sunday, September 2, 2007, I logged on to the Sunday Leader website, as I often did, to see my father’s banner headline that the “MiG deal crash lands on defence ministry.” According to this reporting, the “MiG Deal” in which Gotabhaya Rajapaksa had claimed to be uninvolved in on television, was orchestrated by his cousin, Udayanga Weeratunga, and began with a meeting between Rajapaksa, Weeratunga, the then Air Force Commander and one of the Ukrainian masterminds of the deal. That meeting with Rajapaksa, the Leader reported, took place on February 6. It was only the next day, they said, that the Air Force suddenly developed a longing for MiGs and the Air Force Commander wrote a letter to the Ukrainian conspirator to ask for a proposal. I have seen this letter from Air Force Commander Donald Perera to Ukrainian national Dimitri Peregudov, dated February 7, 2006. It was not even written on a letterhead. Typed in the same ‘Comic Sans MS’ scribble font with which kindergarten teachers printed posters for infants, it was little more than a childish cover-up. This letter was supposed to belatedly transform the ‘unsolicited’ proposal that his boss’s cousin had shoved down the throat of the Air Force Commander the previous day in the then Defence Secretary’s office into a ‘solicited’ one, so it could be considered under procurement rules. As far as I know, no one has to date asked Donald Perera why he suddenly asked for a proposal for MiGs, having written to the Defence Secretary barely two weeks prior that the Air Force needed to consider a broad number of options, not just MiGs, in choosing its new bomber aircraft. Throughout his career, my father was the maestro of litigation and a decorated veteran of wars of words. What he soon found himself in was a war of a more sinister sort. A couple of weeks after the snarky reply to Rajapaksa’s letter of demand, on November 21, 2007, black-clad commandos stormed the offices of the Sunday Leader, held the security staff at gunpoint with assault rifles, and set the printing presses ablaze. It will come as a surprise to none that not a soul was ever investigated, arrested or prosecuted by the police for this pathetic act of cowardice. Three months later, my father got the war he was waiting for. On February 22, 2008, Gotabhaya Rajapaksa filed a lawsuit for defamation against my father and the Sunday Leader, charging that the allegations made by my father against Rajapaksa were false, malicious and defamatory. By then, I was living with my father at our home on Kandewatte Terrace in Nugegoda. I was flummoxed at how he was bouncing around the house, grinning from ear-to-ear in response to the news that he had been sued, almost as if he had slept with a shirt hanger in his mouth. I looked at him more quizzically than lovingly in search of an explanation. Once he had finished whatever important phone call he was on, he finally turned his gaze to me and beamed. My memory of our exchange is no doubt tainted by over a decade of agony, but this is what I remember. “You see….” I think he started, hanging on the word “see” in a telltale signal that a sermon was to follow. “When someone sues you, they have to take the stand and be cross-examined. In any normal lawsuit, you can only ask them about things that are directly relevant to the actual case,” he explained. “Defamation is different. If someone sues you for defamation of character, you can ask them under oath about absolutely any aspect of their life,” he went on. “If he says his reputation is worth so much that I have done Rs. 1 billion in damages, I can defend by showing that what we wrote is true and in the public interest, which is correct. But we can also have some fun.” With all my father’s notoriety for journalism, it was easily to forget, except in moments like these, that he was a lawyer at heart, and a card-carrying member of the Bar Association. To borrow a phrase from the Sunday Leader, “in a nutshell,” my father said he would adopt a legal strategy of proving to the court that Rajapaksa’s reputation was worth no more than Rs. 10, as opposed to Rs. 1 billion. This he would do, he said, by exposing every skeleton in the defence secretary’s closet, by personally questioning him in a public courtroom under penalty of perjury. The proceedings, he proudly planned to publish in his newspaper to show the country who Gotabhaya Rajapaksa really was. After explaining his plan, he left me with a life tip: “Never, ever sue anyone for defamation,” he warned. His mood darkened sharply in late May 2008, after the abduction and torture of fellow journalist Keith Noyahr, who had himself been critical of the defence establishment. By December of 2008, when the district court issued an order preventing my father from writing about Gotabhaya Rajapaksa, he had become a lot more fatalistic. I would ask him sometimes, like when we were curled up on his couch upstairs watching a movie, whether he was still excited about questioning Gotabhaya Rajapaksa in court. He would be evasive, and on one occasion confessed to me cryptically that he didn’t think they would ever let him get that far. When I asked him what he meant, he hugged me, kissed me and reminded me that if anything were to happen to him, he had left a letter with instructions, and some money, in one of his jacket pockets in his wardrobe. I couldn’t breathe. I don’t remember if that was because I was frightened by what he said or because he was squeezing me too tightly for me to get air into my lungs. It was difficult to be scared or frightened around my father. It was the following month, on the January 8, 2009, that my father was proved right, and we were proved wrong. He woke up that morning shortly before dawn. After he had gotten dressed, we sat downstairs at the breakfast table, and he wolfed down his food before I walked him to his car and he kissed me on the forehead and drove off just like on any other day, at around 8:15 am. I gave our resident driver, Dias, some money to buy me a snack. He asked me to call my father and confess on his behalf that he had left his cellphone in my father’s car, which I did, shielding Dias from my father’s annoyance. A few hours later, I came back downstairs and asked our nanny Manika whether Dias had come back with my food. She ignored my question and avoided eye contact. Puzzled, but unphased, I called Dias and asked him where he was. “I’m at the hospital,” he shrieked. As my heart clenched and by blood turned to ice in my veins one excruciating inch at a time, Manika turned on the television. A news anchor was saying that my father had been attacked – or shot, I don’t remember. I only remember putting two and two together. Dias being at the hospital. Manika’s strange behavior. And a stone-faced news anchor saying my father’s name into the camera. I ran upstairs to my father’s room, reached for the phone and started calling family. My aunt said it must be a false alarm. I called my mother, who lived with my brothers in Melbourne, and told her something was wrong, and that they should rush to Colombo. I waited for my father in his room. He had been attacked, after all, and would want to change into a fresh shirt before going on television and denouncing violence against the media, like he had two days before when Sirasa had been stormed and bombed by yet another platoon of black-clad commandos. 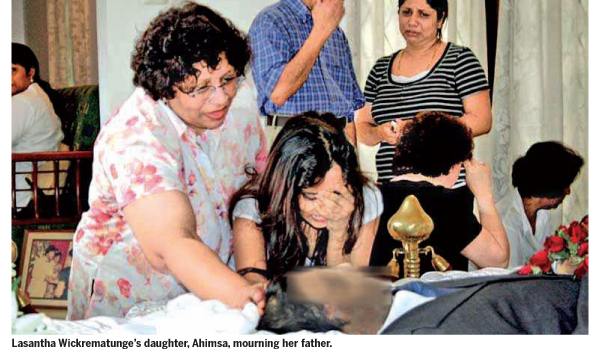 It was almost eight years later, when I met CID detectives Nishantha Silva and Sisira Tissera in December 2016, that I fully understood the lengths to which the forces of evil had gone in covering up my father’s murder. The dedication and determination of these CID officers was the wind at my back and gave me the courage after so many years to dedicate my life to seeking justice for my father. For the first time since January 2009, I was inspired by men who were willing to risk their lives for justice. I felt I had found my place standing by their side. My father was a journalist to his last breath. His last pen strokes, the CID says, came moments before his death, when he wrote down on his notebook the license plate numbers of two motorcycles, which are believed to have been those of his attackers. That notebook has vanished without a trace. In mid-January 2009, journalist Nirmala Kannangara from the Sunday Leader visited Deputy Inspector General Prasanna Nanayakkara, who was supervising my father’s murder investigation. She asked him about the notebook that she had seen with her own eyes at the crime scene. He swore to her that she was mistaken and that there was no notebook. According to several police officers, two of whom made confessions to the Mount Lavinia Magistrate, my father’s notebook was pilfered from the evidence collection by Nanayakkara himself, who also ordered the destruction of all evidence of its existence. Nanayakkara has been arrested by the CID but he has remained mum about who ordered him to destroy this evidence or why. It was around this same time that the oft sullen and solemn Gotabhaya Rajapaksa gave a beaming television interview to the BBC, clearly thrilled to bits by my father’s demise. “Who is Lasantha Wickrematunge?” he infamously quipped. “Just another murder,” he answered his own question. “I’m not concerned about that,” declared the permanent secretary of the ministry in charge of the police, who were ostensibly investigating my father’s cold-blooded murder. Shortly thereafter, he was abducted, hooded, bundled into a white van, taken to a safe house and threatened with certain death should he ever speak of Gotabhaya Rajapaksa’s involvement again. The terrified Dias fled Colombo thereafter. It was only in 2016 that the CID helped him to identify his abductor. The kidnapper turned out to be a senior military intelligence officer named Udalagama, who oversaw security for Rajapaksa’s head of national intelligence at the defence ministry. Dias picked him out of an identification parade. Dias has lived in hiding ever since, with no support from the government to this day. In December of 2009 the CID took over the investigation into my father’s murder for the first time. They didn’t take long. In less than a month, they made a breakthrough. They identified the mobile phones used by my father’s assailants and connected these five phones to the national identity card (NIC) of a poor mechanic in Nuwara Eliya named Pitchai Jesudasan. When the CID questioned Jesudasan about these phones that had been bought with this NIC in November and December of 2008, the terrified mechanic pointed out that his NIC had been stolen six months prior by military intelligence officer Kannegedera Piyawansa. This interview took place on the morning of 18th January 2010. It turns out the CID struck a nerve. That was the last they were to see of this investigation file, which was immediately yanked away from them and given to the Terrorist Investigation Division under mysterious circumstances. No one seems to know why. Meanwhile, according to a Sirasa News expose, on the afternoon of the same January 18, 2010, Gotabhaya Rajapaksa ordered that a military officer serving in an embassy in Thailand be recalled immediately, and that a Major Prabath Bulathwatte be sent in his place. This Bulathwatte, as it turns out, was the commanding officer of the “Tripoli” military intelligence platoon whose officer Piyawansa was tied to the phones used in planning my father’s murder. For some reason, the defence secretary himself was in a mighty hurry to send this Major abroad, in violation of the presidential elections regulations that were in place with the polls barely a week away. The sad truth is that for all their dedication and hard work, most of these facts had been unearthed by the CID well before I first met the investigators in December 2016. Despite the Major Bulathwatte’s Tripoli platoon having been caught red-handed, not just in my father’s murder, but also in the abduction and torture of Keith Noyahr, they remain at large, roaming free with their secret budget, weapons, white vans and motorcycles, and zero accountability. Over 20 military intelligence operatives have been arrested over abducting, killing or torturing a bevy of journalists, but neither the army nor the government has lifted a finger to draw back the iron curtain of impunity that has shielded these killer squads for over a decade. Evidence is withheld from the CID on “national security” grounds, even as the military intelligence apparatus keeps the CID and those who assist it under constant surveillance and continues to try and cow them with scare tactics. As they drew closer to the truth in the two years since, the CID faced more and more bureaucratic hurdles and administrative roadblocks. Senior political leaders green and blue alike have been complicit in obstructing their investigations and providing more aid and comfort to the suspects than the detectives and witnesses. Some who risked their lives to become CID witnesses lost their jobs and been thrown out on the street. People often say that politicians control the CID. I have seen just the opposite. The CID has charged bravely ahead, incurring the wrath of politicians of all stripes as they dance on the thin ice between their patriotism and the termination of their careers. “Be that as it may,” my father would say, the silver lining of this obsidian cloud is that it becomes clearer by the day that covering up the truth of the “MiG Deal” was literally worth a killing. The FCID investigation has proved every word my father exposed about that scandal. It has gone further. The Ukrainian government told FCID that they had nothing to do with it, and the FCID have proven that over US $7 million was stolen and laundered through shell companies in myriad tax havens. Interpol is hot on the heels of Udayanga Weeratunga. Even as politicians have labored to stifle the CID investigation into my father’s murder, the FCID investigation into the MiG deal has proven beyond doubt that my father was on to something when I spoke to him from Canada in August 2007. I tracked down the interview that he was referring to on that call. Gotabaya Rajapaksa, clad in a crisp pink shirt and a subdued tie, talked about the MiG deal to Derana TV at 9:30Pm on 19th August 2007, on their “360” program with interviewer Dilka Samanmali. My Sinhala is beyond atrocious, so I needed help with translating what I heard. After a 30-minute party-line sermon about how proper the MiG deal was, how no third parties were involved and how he had nothing to do with it, and of course, after insisting that the articles about the scam were to support the LTTE and demoralize the armed forces, Gotabaya Rajapaksa shifted to the topic of media freedom. “They put my picture, and write filth,” he said. “If they can get away with that in this country, where else is there more freedom,” he went on. “After writing these things, they can nicely drive their cars by themselves alone on the road and nothing happens to them,” he shamelessly boasted, raising and waving hands up and down in a mocking gesture of a driver holding a steering wheel. My father put this claim to the test ten years ago. He found out that this boast was no more accurate than Gotabaya Rajapaksa’s sincerest assertions about the legitimacy of his MiG deal. I know the former secretary is “not concerned about that.” I am.